Grace Jennings at work in her studio; see more of her work at www.graceyourtable.com. 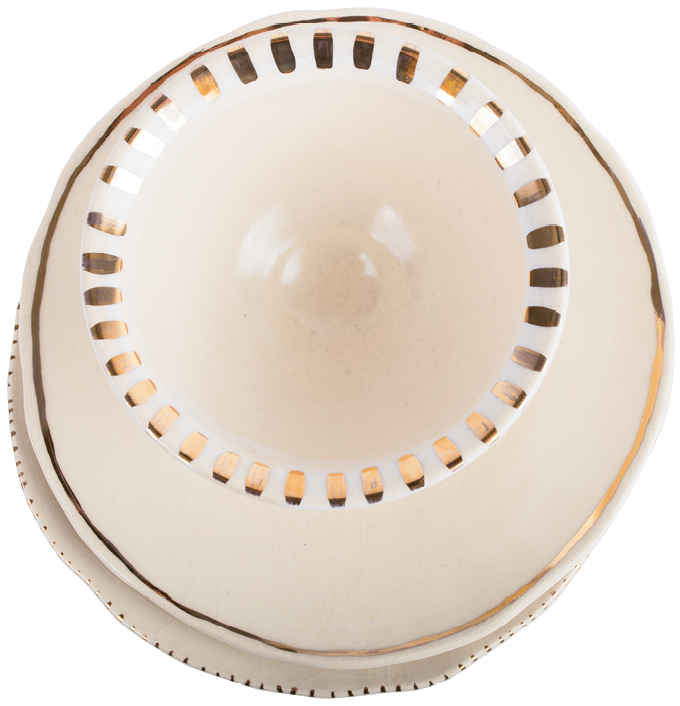 Jennings says she sees the moon in these gold-rimmed pieces from her new dinnerware line. Jennings took cues from dishware she created for Cannon Green when making these porcelain and stoneware pieces. Forget maître d’s and booked restaurants: Grace Jennings’s dream dinner is one where she’s made everything on the table. And given that she earned a fine arts degree from Clemson University and an F&B management degree from Culinary Institute of Charleston, that’s well within her reach. Indeed, Jennings boasts kitchen and kiln skills galore, thanks to a few years working with local chef John Ondo and an apprenticeship at CBFB Tablescapes, an area biz that creates plates (and more) for restaurants including Husk, 492, and Básico. Now out on her own, the ceramicist has made tableware for Cannon Green and for sale at the Preservation Society of Charleston. 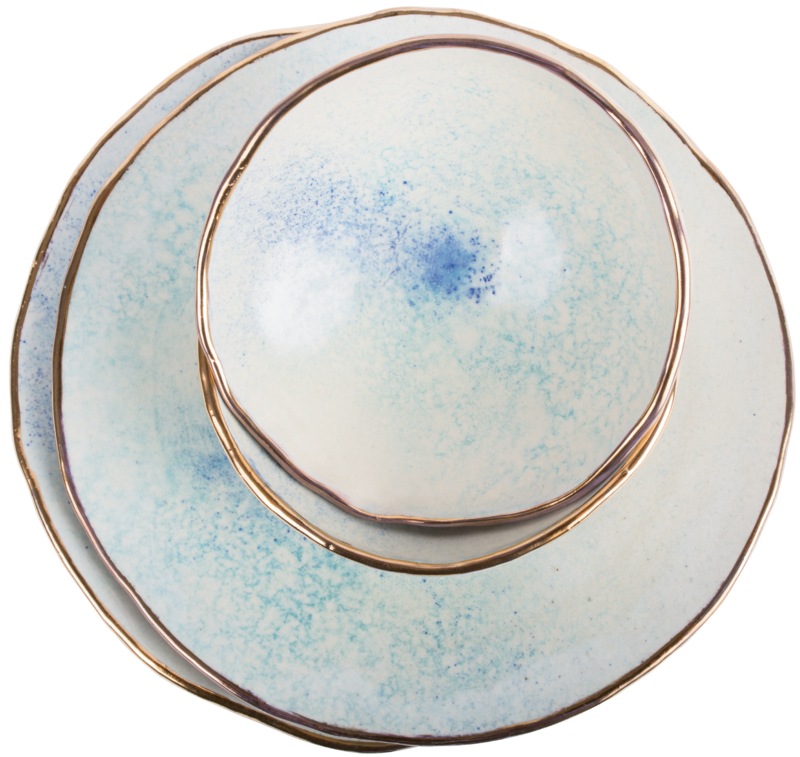 We popped into her Clements Ferry Road studio to get the dish on her dinnerware. 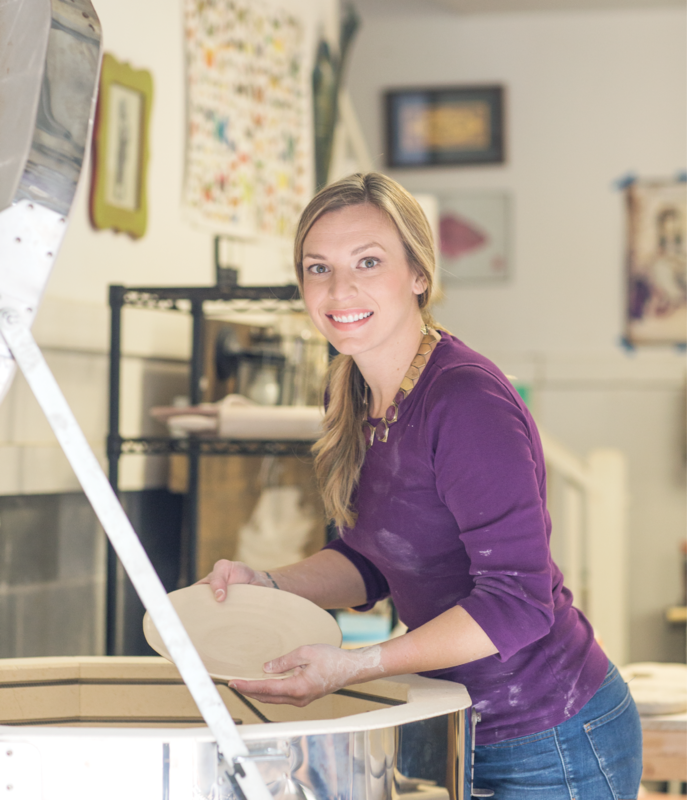 Finding her feet: I did some paint-your-own pottery when I was younger, but Clemson was the first place I got to work with wet clay from scratch. I was sold. As an art major, it drove me crazy to spend so much time on one painting or drawing. What I love with ceramics is that you put the clay in front of you, give it your best shot, and then it’s on to the next one. Molding a career: I found out that CBFB Tablescapes needed an extra set of hands and, before I knew it, I was getting paid as a potter. I couldn’t believe it! Repetitive motion: As an apprentice, I really loved working on my muscle memory. Husk doesn’t need just one plate; it needs hundreds. You learn a lot from doing the same movements over and over. A new spin: Each batch of clay has a different personality. Natural materials fluctuate, or maybe the clay suppliers stopped digging in Tennessee and started sourcing material from Kentucky to save costs. The bigger picture: Ceramics is really physical, and I’ve learned tricks for making the process work for my size. I’ve always wanted to get into serving pieces, so I spent some time in Asheville this past fall working with artists who make large bowls and plates. Before that, I felt limited to working with eight or nine pounds of clay. Now I’m up to 25. Practical matters: As an artist, functionality can sometimes be limiting. Some of the potters I admire use materials that could be toxic in dinnerware. My work has to be food safe, and most of my pieces have to be stackable, since kitchens need to store them in a smart way. Tricks of the trade: Glaze recipes are developed from scratch, a lot like food recipes—except you can’t taste-test them! In fact, when I buy a new tool, like a whisk, spatula, or mixing bowl, I typically buy one for my studio and one for my kitchen. Work in progress: I’m still finding my identity. Currently, I’m inspired by the ocean and use lots of gold. But the pieces in my mind are so much more than what I’m limited to now. I feel like there’s a lifetime of work to be done. Molding ties: I want to make more work for the Preservation Society and to continue building strong relationships with restaurants, so if there’s an item they constantly need, I can provide it. Studio noise: I cannot work without something on in the background. I love true-crime podcasts, like Serial and Undisclosed. When I listen to music, it’s typically just instrumental stuff—never too many lyrics. One of my favorites is a DJ called RJD2.